Nothing says Texas like brisket, that flavorful cut of beef with just the right blend of fat. For folks in every part of the state, it’s the king of BBQ. 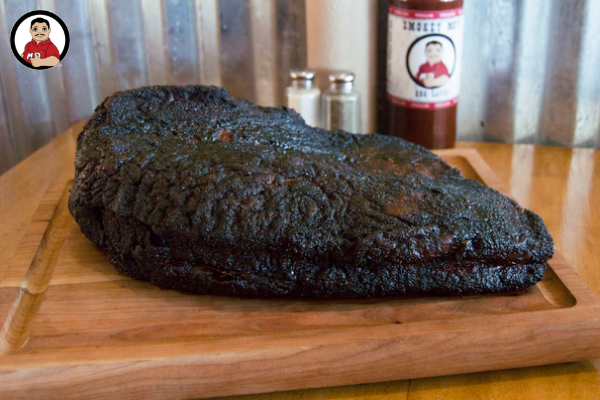 At Smokey Mo’s, we’ve been smoking up brisket for 19 years in our restaurants – and even more years at home. In our restaurants, we use combination wood and gas pits that help us keep consistent temperatures and moisture. This makes it easy for us to spice it, smoke it, rest it, and serve it up for your enjoyment. We know re-creating that at home can be a little more difficult, so we’re happy to pass on what we know to all our home grillers! Fat cap/fat side up: When butchers trim a whole brisket, they leave a thick layer of white fat on one side of the brisket. This is called a “fat cap.” When we smoke our briskets, we want the fat cap to be on top, so that as the fat melts during the cooking process, it disperses throughout the meat, leaving it tender and moist. Marbled (aka moist)/lean: Marbled brisket is the part of the brisket that is closest to the fat cap and has the most fat running through the muscle. This cut of meat is generally more moist and tender. The lean part of the brisket is the part furthest away from the fat cap. Although it still contains some fat, it does not contain as much as the marbled. Lean brisket dries out quickly, so quality checks are important. Bark: The bark is a combination of the spices, fat, and smoke that hardens on the outside of the brisket as it cooks. It is highly flavorful and for many people, the favorite part of the meat. The golden rule of brisket prep is “slow and low.” To transform a tough cut into a tender delight, the meat needs to cook slowly at a low cooking temperature. To cook a full brisket in time for dinner, you may want to fire up the grill before breakfast. Trim the fat to a thickness of ¼ inch. Inject the meat 12 to 24 hours before cooking. If injecting, you want your injection to be at room temperature, and you want to inject in a one- to two-inch checkerboard pattern across all the meat. Season the brisket. Whether using a dry rub or wet sauce, you want to season the brisket before placing it on the grill. You can do it right before putting it on the grill, or when you do your injection the day before. We prefer a dry rub to start. Place the brisket on a clean sheet pan. Shake spices over the entire brisket until it is covered in a heavy covering of spice. Gently pat (do not rub) the spice onto the brisket to help it stick. Flip the brisket over and spice the other side in the same way. Prepare the grill. You want the grill to be between 250˚F and 275˚F. Once your coals are gray, add a small piece of wood. We prefer post oak. Add small pieces throughout the smoking process as wood burns away. Slow-smoke at a temperature of 250˚F, allowing about one hour of cooking time per pound of meat. So, if you have a 10-pound brisket, expect to smoke it for about 10 hours. Keep the fat side up so the juices can drip through the meat. Wrap in foil. Begin by smoking your brisket unwrapped so the fat, spices, smoke, and heat start to create the bark. For about half of the cooking time, wrap your meat in foil to preserve moisture and also steam the meat to make it even more tender. Finish the brisket unwrapped for at least an hour to maximize the bark creation. To determine when to wrap in foil, take the total cook time minus one hour minus half your cooking time. Example: If your total cook time is 10 hours, half of 10 hours total cook time is five hours. 10 hours minus one hour minus five hours is four hours. At four hours, wrap the meat in foil. Remove the brisket about one hour before your final cooking time, or when the brisket reaches an internal temperature of 200˚F. Remove the brisket from the foil and place it back on the pit. Smoke the meat unwrapped for the rest of the cooking time to crisp up the bark. Sauce or glaze your brisket. If you want to add a sauce or glaze to your brisket, do so after you have removed the foil and allow it to continue smoking for about another hour to create the bark. Remove from heat. Wrap the meat in aluminum foil and it let stand for 15 minutes. Cut against the grain into thin slices. Visit Smokey Mo’s for a Break From the Backyard Grill. Vary your home grilling routine with a trip to Smokey Mo’s. Moist, fresh cut, and smoked to perfection, brisket is a specialty at the 16 central Texas restaurants throughout central Texas. Round off your feast with delicious sides, like crisp coleslaw, buttered potatoes, and house-made pinto beans. Top it off with a scrumptious home-made dessert. Order in, carry out or call or click in a delivery from Door Dash or Uber Eats. Crown the king of BBQ with Smokey Mo’s!